Cannellini beans, also known as white kidney beans, are one of the many nutritious, delicious beans that are also beautiful. Photo by Tanya Shkondina | IST. Here are terms including cassava and couscous. If you’d like to suggest additional words, use the Contact Us link on this page. See our many other delicious food glossaries. 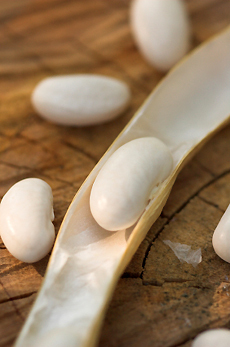 A glossy white, oval bean with a thin skin and mild flavor. See photo at the top left of the page. Cassava (Manihot esculenta), also known as manioc and yuca, not to be confused with yucca—is the root of a woody shrub native to the Amazon basin. It is the third largest source of carbohydrate food in the world, and a staple of nearly 500 million people worldwide. * A popular replacement for potatoes in the countries where it is grown, it a resilient root and grows well in arid or drought-ridden soils. Thousands of years ago, the subtropical plant was carried from the Amazon basin throughout Latin America and, through long boat journeys, to Africa and Asia. Today, it is cooked in a variety of ways, from purées (liked mashed potatoes), fried, made into dumplings, added to soups and stews, made into bread, pies and puddings. 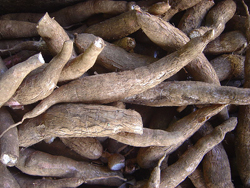 Tapioca is made from cassava root flour. Photo of cassava root by David Monniaux | Wikimedia Commons. *Claude Fauquet and Denis Fargette, (1990) “African Cassava Mosaic Virus: Etiology, Epidemiology, and Control,” Plant Disease, Vol. 74(6): 404-11. Processed grains that are generally 75% to 80% carbohydrate. Can be commercially processed or homemade. 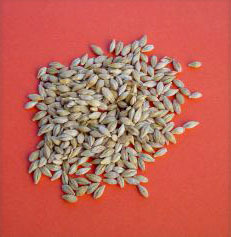 Cereal includes any plant from the grass family that yields an edible grain (seed). These include barley, corn, millet, oats, quinoa, rice, rye, sorghum, triticale, wheat and wild rice, plus lesser-known grains. Because cereals are easy to raise and inexpensive, are a readily available source of protein and have more carbohydrates than any other food, they are a staple throughout the world. Photo of barley grains by Luis Rock | SXC. This is a robust and versatile lentil or dal, a split and husked relative of chickpeas (Cicer grietinum). It looks somewhat like toor dal (which is a different dal altogether). Channa dal refers to the hulled, split chickpea, and is used often with sweeter vegetables, such as pumpkin and zucchini. Easy to cook, it is the most popular legume in India. Pronounced KOOS-koos, this wheat product is more than 1,000 years old. The Berbers, native to the mountains of Algeria, Morocco and Tunisia, would go down to the valleys to gather and conserve wheat. Over generations, they learned that by grinding the wheat and making couscous, it would keep for years, insurance from drought and famine. Long a staple of North African cooking, it is now widely available in most supermarkets. Specialty producers such as Bob’s Red Mill also sell whole wheat couscous and tricolor: green (spinach flavored), red (tomato flavored) and white pearls. Couscous is not a grain but yellow granules of semolina, made from durum pasta wheat, which are precooked and then dried. The word can mean the pasta itself, as well as refer to the prepared dish. North African stews (tagines) traditionally served over it. Like pasta or rice, couscous is versatile and has numerous preparations. It is simple to prepare: Just add boiling water and let it sit. It can be flavored with exotic spices or served plain. The photo shows regular couscous at the left, and the larger Israeli style at the right. The large grains are the original. They were made by hand-rolling semolina grains with olive oil, water salt on screens, letting the small grains fall through, and rolling them again until a consistent size grain was formed. The grains are then coated with olive oil salt and sun-dried, giving them a toasty flavor when cooked. Photo by Meghan Anderson-Colangelo |SXC. The cranberry red shell of this bean covers a beige-colored bean flecked with cranberry streaks. It is known for its nutlike flavor. In Italy it is called the borlotti, a name by which it can be found in the U.S. as well.